The Combat Survivor is a military styled fixed blade with a multi-purpose design. 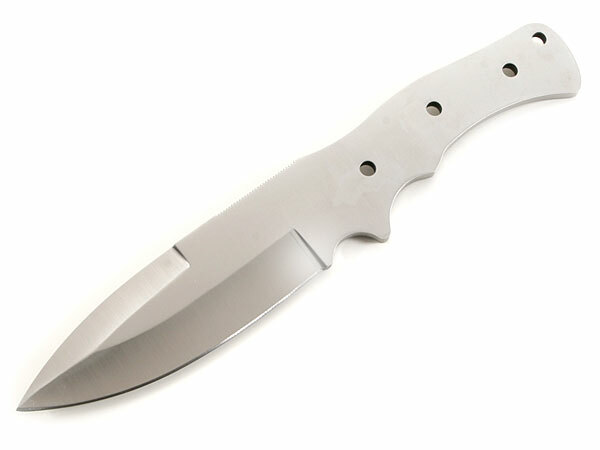 This is an excellent mid-sized design at 10.25 inches overall with a balanced 4.75 inch blade length. This model features a deep false edge and has a serrated gripper surface on the top spine of the blade. It is hollow-ground with a beautiful satin finish and comes pre-drilled with (3) 1/4 inch holes for handle pins. This design also has a 1/4 inch thong hole pre-drilled in the rear of the handle. Made from AUS8, this blade has been heat and cryo-treated for long life, durability and maximum edge retention. For handle construction, use (3) 1/4 inch handle pins, handle bolts or mosaic pins. The thong hole is pre-drilled and is 1/4 inch in diameter.